Want the customer to feel their purchase is special? Go all out with a Saks Be-Ribboned and Branded Shopping Bag. For the right size purchase (i.e., pricey) I have seen Saks sales consultants delay assisting a minor queue of customers in order to insure that one premium customer is treated special. (Translation: my wife is known to spend money if she likes something and is served well). 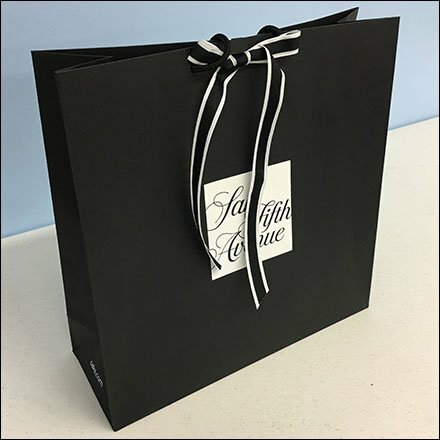 Compare this Saks Be-Ribboned and Branded Shopping Bag with others in the branded bag reviews linked below.